"Sampath Speaking" - the thoughts of an Insurer from Thiruvallikkeni: filter coffee from coffee bags ... carrying coffee with you ! filter coffee from coffee bags ... carrying coffee with you ! In South Indian culture, the visitor to a House is welcomed and offered a tumbler of coffee. It is an energizer, many have the habit of taking a cup of coffee immediately after consuming their food, especially tiffin items. It is common to see people walking to restaurants / hotels and order a cup of coffee. For most Indians, especially South Indians, the day begins with a coffee in the morning and perhaps at least two more during the day. At home, it is not simply Coffee, but Filter coffee – made from decoction dripping down from coffee powder made of dark roasted coffee beans, chicory – the hot water percolates through the thick powder solely by gravity and not under pressure. To this decoction, is added milk, enough not to change the colour and aura. The fresh coffee beverage literally wakes you up and makes you open to the day’s realities. It has a stimulating effect on people due to its caffeine content and is the most consumed beverages of the World. Coffee berries, which contain the coffee seeds, are produced by several species of a small evergreen bush of the genus Coffea. The two most commonly grown are also the most highly regarded Coffea arabica, and the "robusta" form of the hardier Coffea canephora. One Coffee advertisement used to ask – how much you know about the person whom you love most….. similarly can you instantly list out at least 5 persons whom you love or list out 5 things your city is famous for…. In good olden days, whenever people used to travel they used to travel with coffee contained in ‘kooja’ [a special coffee pot] and then with flask-load(s) of coffee… be it a traveller, or somebody making it at home – concocting coffee without spilling … spillage and perhaps liability is altogether a different issue, interesting one at that. Here is something on ‘World’s first disposable coffee machine' that would let one brew a cup while on the move…. reproduced from a report in Daily Mail. Sometimes instant coffee just won’t cut it, and what you really need is a filtered brew ~ and now coffee fans can get their filtered caffeine fix on the go thanks to the world’s first disposable coffee machine. The product works like a teabag for coffee and promises to brew a quality cup just by adding hot water to the bag. The system was created by Ulrik Rasmussen from Denmark when he ran out of coffee filters for his home coffee machine. The water mixes with ground coffee then drips through a special filter into another chamber, from where is can be poured into cups. 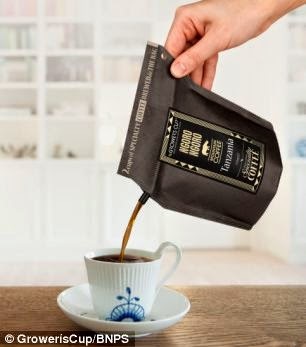 The product, called Grower's Cup, works like a teabag for coffee and promises to brew a quality cup just by adding some hot water to the bag. The water mixes with ground coffee then drips through a special filter into another chamber, from where is can be poured into cups. 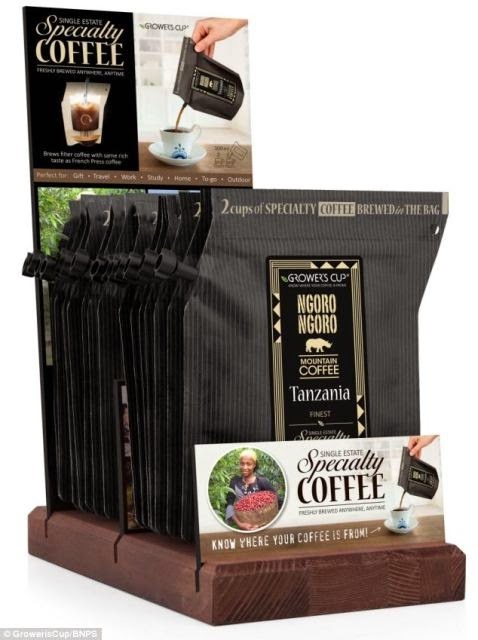 Each Grower’s Cup pouch costs between £1 - £1.50 ($1.70 - $2.50) and they come in 12 different varieties using quality coffee beans from single estates. A bag contains 0.6 ounces (18 grams) of ground coffee which makes two cups when 300ml of boiling water is added. Grower’s Cup, can be used at home, in the office to outdoors. ‘Coffee has all the same attributes as wine - you want to know where the coffee has come from, what its story is, and what quality it is. ‘Our coffee bag is to coffee what the wine bottle is to wine.’ ~ addicts would vouch for that.